i canz live in your engine block??? You are at:Home»Air Force»i canz live in your engine block??? Keesler Air Force Base, Miss., has had a full-on cat drama this week, according to an Air Force News story. Brig. Gen. (Dr.) Kory Cornum, 81st Medical Group commander, parked his staff car by the hospital while he was on TDY, only to have it become the de facto residence of a family of cats: momma and her kittens. 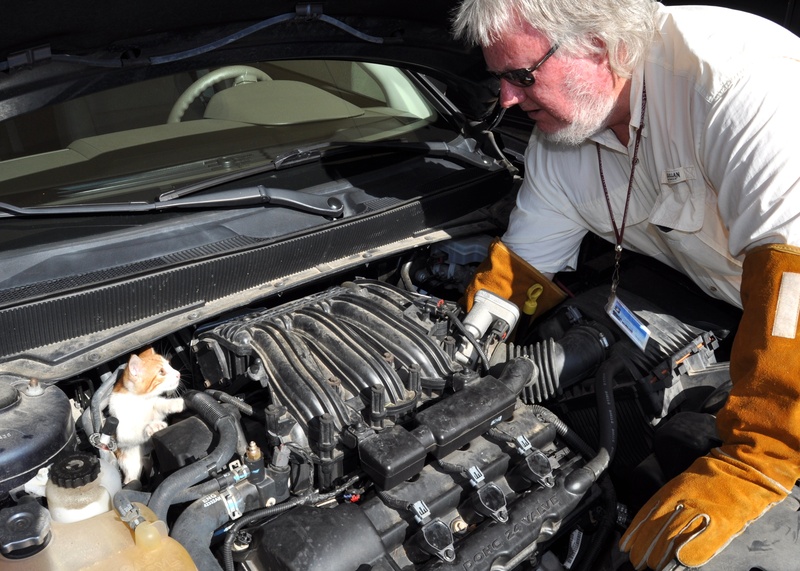 The cat family was noticed by a staff member who saw one of the kittens staring at him from the grill of the general’s car as he reported work. The staff called pest control to round up the kittens — momma had runnoft — but they were uncooperative, as can be seen in the picture above. The whole thing is in something of a limbo right now because they found an airman who wanted to adopt the kittens but when he went to retrieve them from the engine block they were gone. Staff Sgt. Oscar Rodriguez, 81st Aerospace Medicine Squadron noncommissioned officer in charge, said he’ll keep trying to find the sneaky critters. Cats are not pests! Pest management sounds like they are there to exterminate the kittens….Its called animal control…thank you very much!